Alot of people talk about making things happen. My friend Peter, wrote, directed and produced his film. It went to Sundance and its good. "I wanted to take the genre of New Wave -- the fun of it -- and exploit the modern relationship." THE REELER: What can you tell me about A Relationship in Four Days? PETER GLANZ: In a general way it's kind of a satire on the modern relationship. Today's society is so transient; everyone's got TiVo and ADD and all these things. I guess the same thing applies to relationships. I go through what would normally be a four-month relationship in about four days. I kind of parodied how quick all my friends' relationships were going. In some ways a day represents a month or a whole year; these [characters] fall in and out of love in four days. I guess some people find it tragic; others find it funny. It pays homage to French New Wave -- Truffaut, Godard, Rohmer -- and Woody Allen's Manhattan was obviously a big inspiration. I wanted to take the genre of New Wave -- the fun of it -- and exploit the modern relationship. R: The Manhattan homage is conspicuous in the trailer I saw. With that in mind, how did you want to comment on New York -- and the New York relationship specifically -- in this story? PG: I grew up here, and it’s one of the only timeless cities. And I have this whole idea of making movies timeless, whether it using a '40s clock and a '60s dress and then an '80s car drives by. In a sense, by referencing all times you're referencing no time, and it becomes more timeless and universal. I feel like New York City is one of those cities where we're blessed -- it doesn't look like Los Angeles, where they tear something down every five seconds. There are modernist museums next to old brownstones. It was the perfect place to tell this story -- this kind of timeless romantic comedy, in a sense. R: What's your background? How did you come to filmmaking? PG: I went to film school in Los Angeles, and then I've always been a huge Woody Allen fan; I always wanted to come back to New York, and I've always wanted to make movies here. I made several short films and I've been directing commercials for the last two years -- Marc Jacobs, Bergdorf Goodman, mostly fashion commercials. I've actually only made dramas, but it's been really hard to get movies going doing dramas. The first thing I did with wit and charm and was much lighter was a lot easier. It got into Sundance; I have a feature version of it that's being optioned. I got an agent. So that's the way to go. R: So things are going well, but how are you anticipating Sundance -- showing the film to this kind of tough, sophisticated audience on this scale? PG: I don't know. I'm looking forward to it; I'm one of the longest narrative shorts at Sundance, so I'm already asking a lot of people to sit through 26 minutes. I think the average short this year is six-and-a-half minutes. But if people are willing to go and sit down, I think they’ll enjoy it. R: Do you allow for the audience reaction to the short to influence how you approach the feature? PG: Originally it started as a feature, but since the whole Sundance thing I've adapted the feature to be a much more clear representation of the short. The audience's reaction could affect how I see the feature, but I don't know. But at this point, the film is doing well for me. I probably won't be able to watch it in the theater anyway; it's too stressful for me. I'll hide in the back in the shadows. I shot the movie this very time last year, its been a year, so obviously I feel like I'd do this different or that different. At this point I'm just grateful people are receiving the film well. 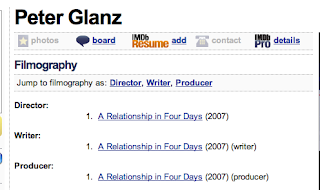 I've been DYING to see his film "A Relationship In Four Days" ... it used to be available on iTunes about a year ago, but not anymore. Is there any other way I can watch this movie?? ?